I didn’t get to spend as much time with this amplifier as I’d have liked to. I simultaneously had in-house the Spendor D7’s, the Shindo Aurièges and the Finale F-7591 you see here. I was so entranced by the first two, that the poor Finale was somewhat neglected. I know, me of all people, neglecting a tube amp! In my defence, the kind person loaning this gear wanted a fairly quick turnaround of 2 weeks, 3 max. Even then, I pushed the limit past three weeks by a couple of days. 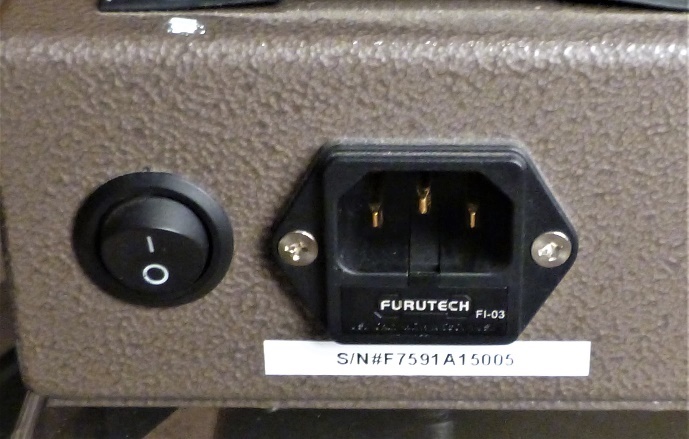 At first glance, the Finale F-7591 looks like a basic tube power amp, nothing wrong with that. On closer inspection, its quirkiness becomes more apparent. Let’s get the quirks out of the way at the beginning, then get on to the important stuff. I don’t like a power switch on the back. If an amp builder doesn’t want to sully the front panel, the least they can do is put the power switch on the side, the way PrimaLuna does. Oh, and a 25-cent LED to indicate power on would be nice. 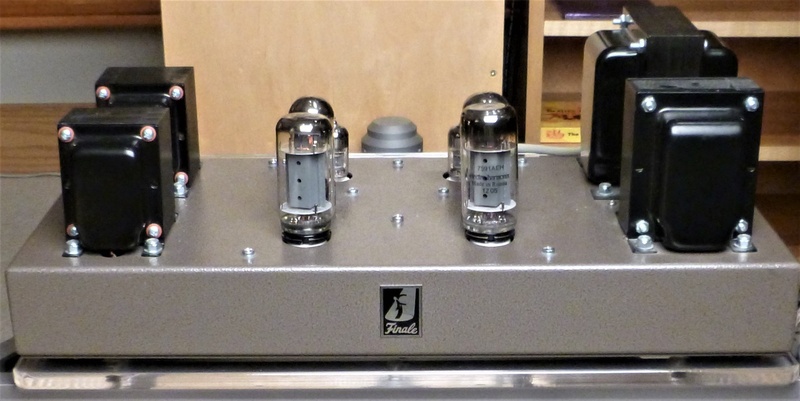 The other quirky thing that struck me as odd, was the choice of two different brands – one JJ and one ElectroHarmonix – of output tubes in the push-pull pair. Sort of like having a Cardas interconnect on one channel and an Audioquest on the other (More like a Cardas to your preamp and an Aq to the power amp. Not that unusual. Ed.). When I explained this to my wife she countered with, “You mean it would be like having a stiletto on one foot and a flip-flop on the other?” Well, maybe not quite so extreme. According to Finale, using both JJ and ElectroHarmonix tubes plays to the strengths of both and the weaknesses of neither. Rated output power is 20 watts per channel. Of almost extreme non-quirkiness are the 12AX7’s, one per channel, used for voltage gain and phase splitting. The 7591A tube is a bit of a curiosity. Introduced in the late 1950’s, the 7591, sized much like a 6V6 of the time, could produce output power approaching that of a 6L6GA or GB. It was also aggressively priced, and undercut many other output tubes. Several manufacturers, including highly esteemed ones like McIntosh and Harman-Kardon, built amps using this tube. The 7591A has a unique pin-out. The 6L6, EL34, 6550, KT77 etc. all share a different pin-out. Well, the EL34 is slightly different than the others, but in most instances is compatible. For a few years the 7591A wasn’t available, and some people had their amps rewired to take 6L6’s or EL34’s. Production of the 7591A was restarted by both JJ and ElectroHarmonix a few years ago. Both, however, are physically larger than the original North American manufactured tubes, so if you have classic gear with tight quarters, then a modern 7591A might not fit. If you want to read more on the history of the 7591, click on this link. Fit isn’t a problem with newly designed amps like the Finale. Layout is spacious, with output transformers at one end of the chassis, the power transformer and a large choke for filtering the B+ at the other. The paintwork is nicely done, it has a retro vibe but the finish is far better than any old amp that I’ve seen. There’s a switch between the two output transformers to set for 4 or 8 ohm speakers. Sure, it’s another set of contacts in the signal path, but the switch looks sturdy, and it’s convenient having a fast comparison when optimizing the coupling to loudspeakers. Parts quality is very good, without being lavish. It was nice to see some Mundorf Supremes used as coupling caps. Everything on the underside of the chassis was tidy, though I thought the binding posts for speaker connection could have used an upgrade. Connection was straight forward, check the link above to the Spendor D7 review for my system particulars. The Finale was free of hiss, hum or any other issues in my system. As far as music goes, it was all over the place, well, no rap or country. If I can ever stop playing with my NAD 50.2, ripping CD’s to its hard drives, and streaming Tidal, I’ll write the review. Actually, come to think of it, I did play some cuts from my cousin Aubrey Graham, aka Drake. Niki Minaj, too. Yeah, the album cover got my attention. “Men are pigs, deal with it”, as my buddy Jim says. Allison Kraus and Union Station got some playing time as well. That’s as close to country as I get. Does Sir Rosevelt qualify as country, Hillbilly Hip-Hop maybe? I streamed some of that too. Even some Daft Punk was thrown in, just for a giggle. Some Sting and Shaggy, on their album 44/876 will give your woofers a workout. I’m no MJ fan, but I can’t resist the baroque production Quincy Jones did on Human Nature. On the more serious side, high res downloads of Miles Davis and John Coltrane were sublime. Even some old Simon and Garfunkel sounded like new on 24/192. Mozart piano concertos sourced from CD rips were decent. If the Elekit TU-8340VK is an urban sophisticate, then the Finale F-7591 is its country cousin. No disrespect to either one, they just sit at different ends of park bench reserved for tube lovers. Both sound modern; neither is slow, ‘tubey’ or rolled-off at the frequency extremes. I’m not a fan of the “classic” tube sound, read: slow, midrangey, no drive. Neither amp would be mistaken for a solid-state amp. The Finale reminds me of a good 6L6 amp; fun, always ready to party, and up for anything. Speaking of the 6L6, I consider it the small-block Chevy of the power tube world. Millions have been made and millions more will likely be made. I’d bet money that more 6L6’s are made every year, thanks to guitar players using tube amps, than all other power tubes combined. The Finale was a bit more dynamic sounding than the Elekit, when driving the Spendor D7’s. The F-7591 also seemed to have more extension in the bass – but maybe a smidge less control. I found the F-7591 had a bit better grip on the Spendor D7’s woofers when switched to the 4 ohm output setting. Through the midrange and into the treble, both amps were more alike than different, though the Elekit might have had a bit better soundstage depth on good recordings, the Finale a bit more “in your face”. The Elekit (with KT77 output tubes) and the Finale both powered the Spendors adequately, but that’s all. No fault of either amp, but the D7’s should have more power to really make them sing. Which is the better amp? I couldn’t choose between them. Both are good. If you are in the market for a good basic power amp, and it must be of the tubed variety, the Finale F-7591 is a must-hear. As long as your speakers and the rest of your system are compatible, it just might be the ticket to long-term musical bliss. With another set of JJ and E-H 7591 tubes, you can mix and match ‘til your heart’s content. Finale also makes the F-7591 ST. 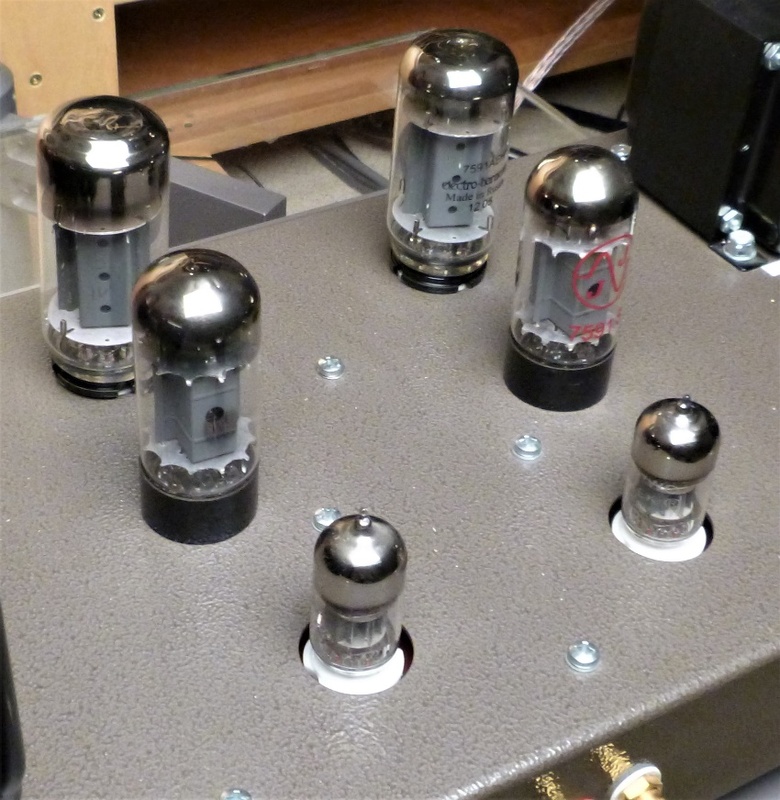 The layout of this amp resembles a classic Dynaco, right down to the tube rectifier. The amp reviewed here uses solid state rectification. The F-7591 ST has more customization possibilities than the standard F-7591 version. If you are ordering either amp and you want say, a certain coupling cap, Finale will do their best to oblige. Thanks again to Peter Wolter, proprietor of Being There Audio in Orangeville, Ontario for the loan of the F-7591. The F-7591, like the Shindo Aurièges, is part of Peter’s personal system. His indulgence of your faithful audio scribe left him without music at home for over three weeks, for which I feel only slightly guilty. If you phone or email ahead of time, Peter will be more than willing to set up the F-7591 in his shop for an audition. I’m not picking on the Finale exclusively here. Most amp builders do it. Do what? Use feet that are too low. The Finale and my Elekit have low feet that make it difficult to get fingers underneath to pick them up. My Audio Research REF 110 has tall feet, but it’s such a heavy beast that, it helps but not a whole lot. The ARC has handles on the front, but being a two-person lift handles on the back as well would be nice. Weigh in on this if you wish. Leave a comment below.